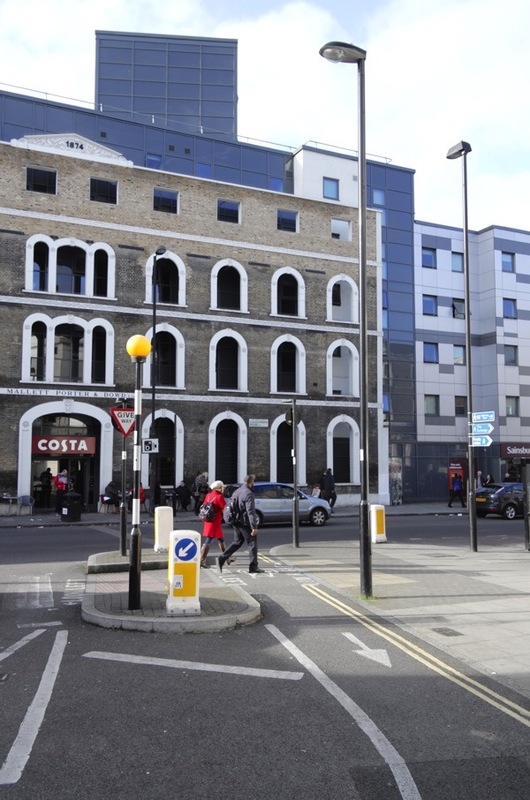 As if I were being poked repeatedly in the eye with a blunt stick, I cannot avoid becoming increasingly aware of a painfully cynical trend in London architecture which threatens to turn the city into the backlot of an abandoned movie studio. If walls could speak, these would tell tales of bad compromises and angry developers who, dissatisfied with the meagre notion of repair and reuse, are driven solely by remorseless greed. 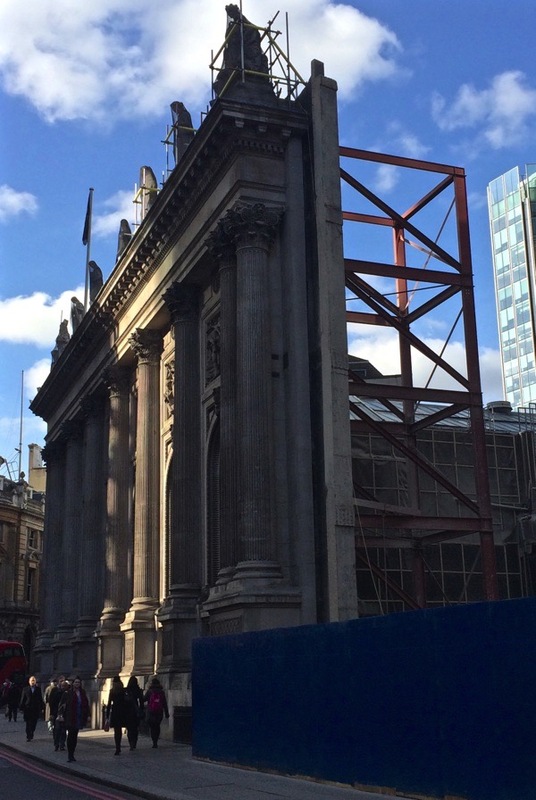 Meanwhile, bullied into sacrificing historic buildings of merit, cowed planning authorities must take consolation in the small mercy of retaining a facade. The result is that architects are humiliated into creating passive-aggressive structures, like the examples you see below – gross hybrids of conflicted intentions that scream ‘Look what you made me do!’ in bitter petulant resentment. ‘A kind of authenticity’ is British Land’s oxymoronical attempt to sell this approach in their Norton Folgate publicity, as if there were fifty-seven varieties of authenticity, when ‘authentic’ is not a relative term – something is either authentic or it is phoney. Can you spot the join in Fitzrovia? Holey moley, GA, I had no idea they were doing such horrible things to London! In my town they tore down a rather nice-looking building that was “too old” and built a new one on the same “footprint”, with similar bricks, windows, façade, etc. It’s a lot like the one that was there, but modern, and works very well. This is the only time I have seen this done. During the 1980′s, a number of nice, Victorian libraries had additions made, usually in the same stone, but in modern style. They make a nice pairing. You can see them in Mystic, Connecticut; Westerly, Rhode Island; and New London, Connecticut. Oh, also Boston, Massachusetts. couldn’t agree more. they are awful, pointless. I live in France and the same kind of architectural ‘arrangement’ is common here too. Hideous – and with the same alluring advertising hype for appartments for ‘luxurious living’. All that results from this is empty, loft-inspired space in which to stock soul-less modern junk for the vacuous. Beautiful buildings with character, all gutted to produce ‘cosmopolitan’ tat, with the usual compulsory gym/swimming pool and cinema so that the present-day owners can gaze at themselves in a ‘me’-fest. We don’t own buildings; we are their guardians until they are passed on to the next guardian. We should just leave a veneer, a trace of our presence and appreciation. 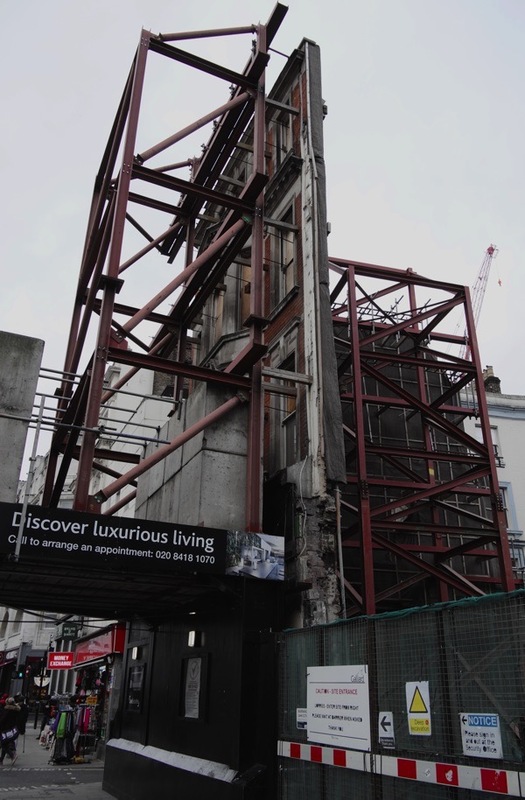 I photographed those facade remains standing sentinel in Smithfield last September and was appalled by the architectural cynicism of the idea. A tribute of sort; the tribute that vice pays to virtue (hypocrisy). That the façades stand is a rebuke to those who preferred what they mask. I think that the façades’ testimony is valuable; standing, they still speak. Truly horrific, and as you say purely driven by greed. Maybe we should borrow a name from Dickens for these greedy, grasping people — the Veneerings. Take a walk down Streatham high street – there are some awful examples of this happening at the moment. Great post. I pass the ludicrous Gun Street façade every day and it feels cynical and patronising. All of the examples are pointless and do nothing to preserve any of the qualities of the actual buildings that have been demolished in the rush for profit. British Land’s ‘a kind of authenticity’ is the sort of self-justifying insincere descriptor we’ve come to expect when corporate greed seeks to stomp an area of character and creativity into the dust. Let’s not even get started on the absence of genuinely affordable homes in the BL proposal. Total abominations. The architects and planners are completely devoid of aestheticism. These buildings look ridiculous and risible. It is unbelievable that they should be allowed to be built in such historical areas of London. Words almost fail me! What a bazaar sequence of photos! You could never make this up. In Melbourne (my home town) they are doing something similar, but at least they are still incorporating the facade into the new building. I guess this is what developers will progress to next, or aim to. A rather ghastly warning indeed. Seems reverse logic. America loves our history. London is losing its identity at a seemingly unstoppable rate. Saddened by the speed and inappropriate nature of ‘improvement’. Alternatives ignored in the cause of chasing greedy profit. Thank you once again, dear Gentle Author. I see such horrors everywhere in the City. It is the fundamental dishonesty of it that is so shaming. It also demonstrates lack of confidence in modern architecture. 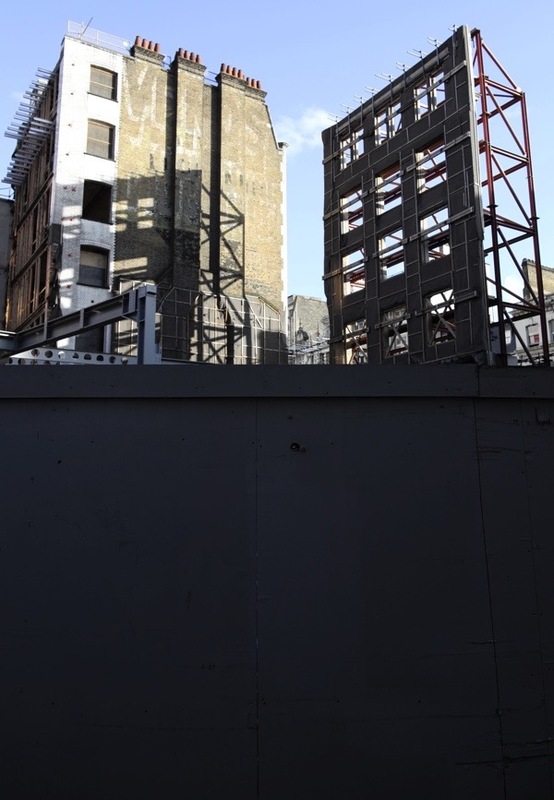 Better that developers demolished out right and build something of real imagination and quality than left these sad ghosts of what was to taunt us with their greed, incompetence and philistinism. You should come to Cambridge if you want to see out of control, hideous development. In great quantity and at some speed. And no social/transport/public services to accompany it. But then Cambridge is pretty much now a suburb of London anyway. The abomination (as you accurately label it) in Caledonian Road is the worst example of this horror show of malevolent schemes. The fact that it received planning consent is in itself a remarkable testament to the gross failure of the planning system – apparently the inspector agreed with the developer’s contention that the occupants (students) did not require the statutory amount of daylight as they would only be using their rooms for sleeping! Notice the complete misalignment between the portals which were once the attractive windows of the former victorian factory with the glass and steel construction behind, built to the minimum floor height permissible so that the view from the box like rooms is of a solid brick wall! The cynicism of this building is a testament to the culture embedded within the building industry today. I honestly thought that the monstrosity in Gun Street was some sort of Avant Garde joke when I first saw it. I only hope that there will be a new enlightenment in the far future where these are restored. Accompanied by lamenting documentaries about how cultural vandals were let loose for a few years before they were all put back in their boxes again. Sadly i dont think i will be about to see it. Heartbreaking to see the way these abominations are blighting our city. This is not any kind of compromise, it’s a mockery. Superbly apposite metaphors for the ugly, twisted values that motivate the elite of British society. These are all – as you say hideous. I have to say that on some occasions I think it can be acceptable if done tastefully. Theres many a fine building in the City for example that would be abandonded or knocked down if the insides hadnt been largely restructured for modern office needs. I will try and find good examples. Judging from some of the other comments, such monstrosities are popping up everywhere. The small southern US town I find myself in currently is no exception – here, new facades on buildings shoddily repaired with chipboard are common, a slap of white paint to conceal mold here and there. A travesty. The sad and cynical thing, in my opinion, is that modern buildings are deliberately built *not* to last in order to keep the building trade in business. Most of these buildings they are tearing down whilst retaining the facade are far more solidly built than what is replacing them. I live in a building that’s only just 10 years old and it baffles me than its so badly built, especially in terms of heat insulation and soundproofing. I go past the example on Caledonian Road regularly and always shake my head in disbelief. How can planners accept these kind of Frankenstein monsters as acceptable/desirable and how can architects be complicit by taking on these kind of projects and being responsible for this kind of car-crash architecture. Well, I know. Money. Appalling. Even worse than a theme park, which at least is honest about what it actually is. This is the architectural equivalent of slapping on a filter on your phone to make a so-so photo look better but much worse as it exists permanently and unavoidably in steel, bricks and mortar. I thought the old buildings of London attracted visitors so why are we destroying so many?! I can’t believe that planners and architects thought a modern building built on to a beautiful old façade full of character was a good idea. Some of your examples are ugly and ridiculous. They can’t even hide behind the excuse that these new buildings are for social housing, they are for the rich. Greed is killing the London I knew as a child. How is this being allowed!? Surely the planning system has not failed us that severly? Is there not sufficient protest groups, pressure groups, or if nothing else a sensible conservation officer spearheading sanity? What about appeals? Blimey, a very very sad state of conservation. Is it not better to remove the facade all together rather than keep a small proportion of what once was there and be more honest? What has SPAB done to help prevent this from continuing? S0rry, just really shocked. How does anyone think that what is in those photos is quality design or architecture? Placating conservationists is more like it. The look of a film set indeed. I feel we need to lobby for changes to legislation, requiring developers to leave a majority of the structure behind the facade intact, or at least attach the new buildings directly behind the facade. The current law simply allows this greedy, cynical approach which looks ridiculous and sad. What’s the point of retaining the skin of a building anyway, when the atmosphere, patina and internal features – it’s very essence – is destroyed? This is all dreadful but, sadly, not new. The first time I was aware of this was in Paris in the late 60s/early 70s, and certainly it has been happening in London since the late 60s. Many of the Regent’s Park terraces are new-build behind the John Nash facades, but one of my least favourites is a building (now) known as The Collection at 198, High Holborn. There was a great battle about these buildings in the early 70s and as a compromise they were preserved as facades. The chief villain was Col Richard Siefert who is, historically, responsible for many of the major violations to the fabric of post-war London. He was very gifted at thwarting planning law, and the success (sic) of his vision is all around us. He was responsible for Centre Point which was/is liked by many. After almost 50 years it still offends me, and I cannot understand its defenders. The Collection is Siefert at his worst, and the manner in which he has retained the facade, in such a way as to diminish it (poor details, bad windows, set into a context of 60s Brutalism), shows very clearly what he thought about London, about the people who live here, and architecture in general. It Ispainful to see so many examples of shoddy work which are intended to prop up older more distinguished and functional building. This is rubbish work. This is worse than I thought it was – thank you for posting this one. There are always arguments (not always good ones) for integrating a beautiful facade into a new build but what is the point where there is no attempt at integration? 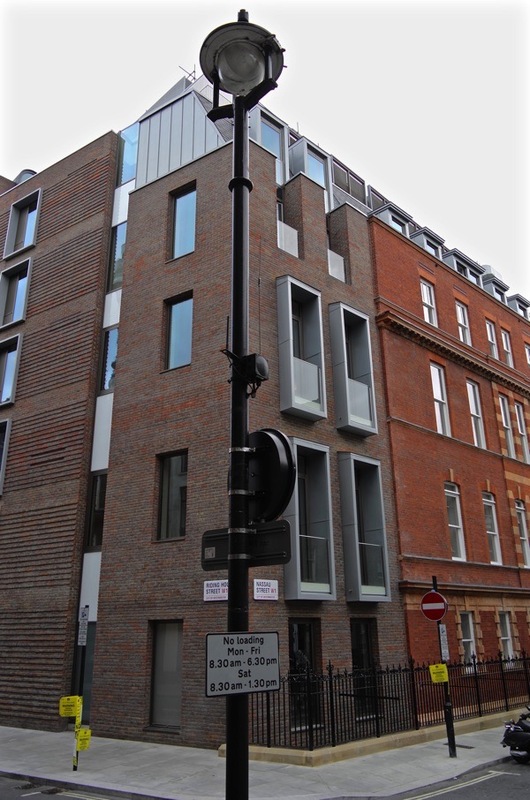 The Gun Street example is hideous; an eyesore. And I guess that was what the builders intended so that at some point in the future they will apply to tear down the facade which will have been allowed to decay. Totally cynical. Oh no! I had to check the date out. We have passed 1984 haven’t we? Surel thos GAPS are a health & safety issue. The SCHOOLS. Now, there’s a great starting point for environmental studies if they have such a thing these days. Certainly Geography & History & Politics & Philosophy & MATHS & English (sorry, Numeracy & Literacy} could cover this HOT topic. The local MP? The Cabinet. The PM. Samantha? The OPPOSITION. I have seen the future & it is not nice. Crikey, I don’t even live in London & I care about this. Sighs. Lowers head on laptop. Sighs again. Janus faced buildings created by a sterile community who use money to “sanitise” neighbourhoods to the point of cultural extinction. Well said and well photographed gentle author! You are an admirable voice in drawing attention to what is happening all over London and I wish all strength to your pen/keyboard/leadership. We are consistently killing the flock of geese that lay those golden eggs for us who live in London and for tourists who visit our city. Your readers are marvellously eloquent in their views, but who is championing them at government level? Look at the range of competing interests in the portfolio of our Minister of Culture. And look at the deliberate weakening of local authority powers over the past 25 years. Public service and public interest counts for so little against private money. Oi vey! Architects or city planners or whatever you choose to call them, are also doing this in Chicago in its historic Loop area. It’s a con for real preservation, in my opinion. Interestingly, amongst the dross, one of your pictures depicts the Women’s Library, designed by Wright & Wright and opened just after 2000. Here, rather than a developer’s rapacious quest for space meeting a near-powerless planning department, the retention of the wash-house facade was a deliberate strategy on the part of the architects to retain a specific memory of previous uses on the site, extremely pertinent to the function and role of the building. I am aghast! I’ve never seen anything like this. Appalling. Heartbreaking. Horrifying as much for the fact that it could happen at all, that you wonderful Brits could have produced people who’d even think of such a thing, who’d produce it, who’d allow it to happen. If I’d been asked which of our two nations (mine being USA) had accomplished this travesty, I certainly would have thought it’d have been mine. We’re at a harsh point in history, are we not? Here my my land, hoards of people are clamoring for a racist jingoist to become president. In yours, you have people foisting this architectural idiocy on your citizens. Thank you for being there, Gentle Author. Yeah, why bother. Unless it makes a building still look like nothing ever happened, why bother. A great example is on Baker Street. 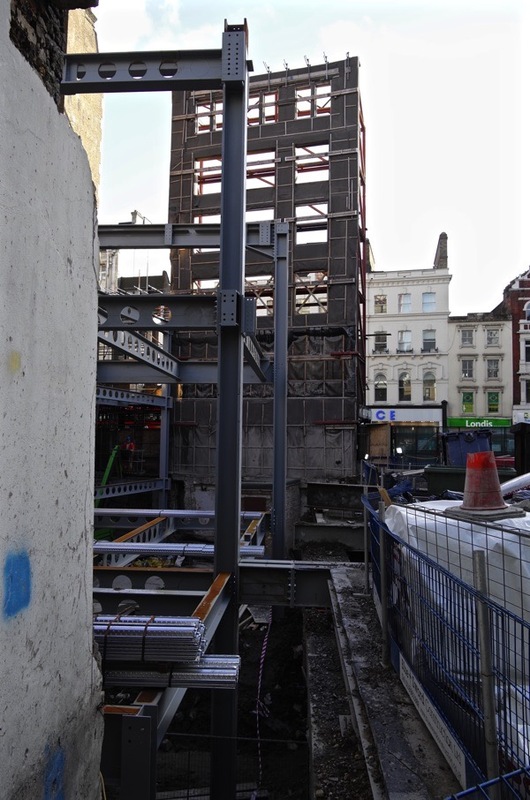 (top end) the old art deco building on Baker Street was completely gutted and then the facade kept (no mean feat) and its fully back to looking almost as good. Makes me feel sick. ( A Londoner). I must say, I have never seen anything like this. Neither those who want to preserve these lovely old historic buildings, or the architects who have been commissioned to design new buildings to take their place, end up with an winning solution. I think both parties must walk away feeling disenchanted. I am not English and I live “across the pond” but I think you have the best city in the world. It pains me to see buildings that I would describe as quintessential London, being destroyed. I wish the Gentle Author, and all like minded Englishmen, success when it comes to saving these treasured buildings. When Toynbee Hall knock down the flats around the Hall, they will (once again) leave the College Buildings facade standing. I didn’t realise this ludicrous practise was so widespread. I am actually feeling nauseous. both the facade and the building will decay faster due to the foetid air trapped between them. The one positive aspect is that, ironically, non-humans may find additional living spaces within the rotting cavities of these shameful juxtapositions. I am speechless, and I assure you it takes a lot to do that. Where will it all end I ask myself. Rubbish architecture in every photo and I guess that this is just the tip of the iceberg, how shameful that we, as a nation, have sunk to this level. And there, I did find something to say after all!! These “piss weasels” wouldn’t know heritage if it jumped up and bit them! A few weeks ago I visited London, the Tate Britain. Afterwards I walked along the Embankment towards Chelsea. I felt alienated for the first time from the city I grew up in. In particular all along the south bank as far as I could see, cranes and buildings going up, Battersea Power Station, God only knows what they are doing there with glass. It all looks wrong, especially all this glass in such an old city. They will entomb themselves, this race of “piss weasels”, in glass. What sort of lives do these people live?I’ve never been so glad to return home. Gentle Author you are a rare touchstone of sanity, wisdom and sensitivity. I don’t know what the answer is to this but I know it would not have happened under Ken. Appreciate very much the care you take. When I look at these photos, I am reminded of those hollywood cowboy sets where the boardwalks and fictitious timber buildings of the ‘wild west’ were in fact just fascias held upright with bolts and nails and fixed together with a timber lash-up behind. 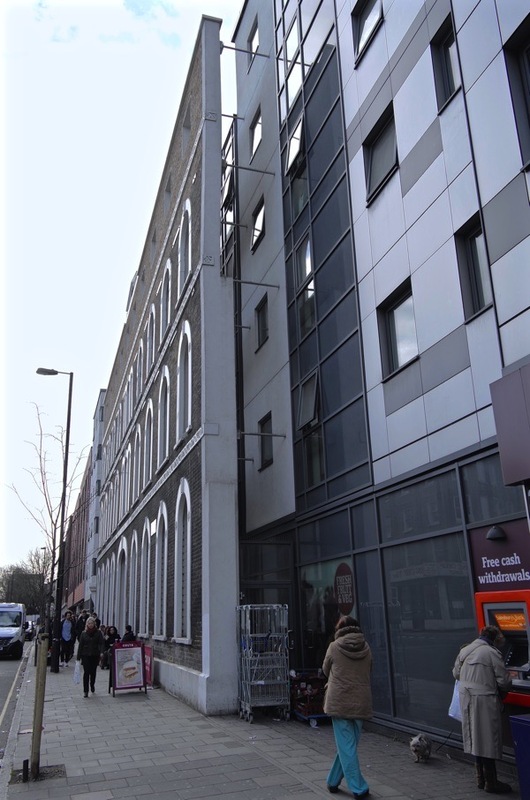 In this regard, the view of the facade in Gun street looks just faintly ridiculous. Is this an architectural joke? I’d hope they’d make some effort to actually add it into the architecture and compliment that architecture. Not as an appendage that contrasts so much. this must be stopped. Oh my goodness! I can see the joins. It’s horrible. Ealing Cinema – https://goo.gl/maps/W3izRPq7cF82 – if you use Chrome you can see it back in 2008 and then reduced to a façade by 2012, which it’s now been for the last 5 years with no sign of activity. 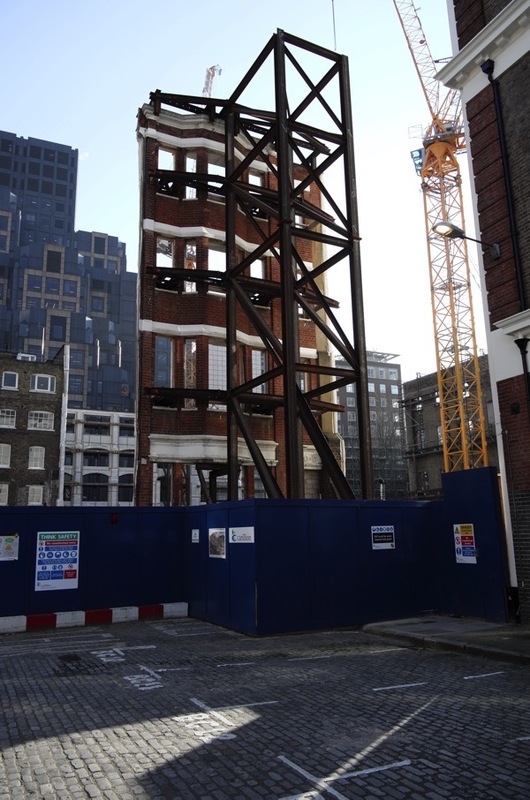 One might wonder if the developer is just waiting for it to fall down of its own accord? My thoughts are exactly as those that have commented before me. It is all ugly and soul-less and I can only wonder what schools are teaching architects that they can think there is beauty in these repetitious steel and glass boxes! Most of the historical architecture of Brisbane, Australia, has disappeared thanks to a previous Premier and greedy developers but at least, with a few buildings in the centre the facades have been kept but not as the London ones have been kept. The latter look as if they have been divorced from what has gone on behind (and justifiably so) but at least in Brisbane they have incorporated the facade as the front wall of the new building so the streetscape appears unchanged – until you look up! As a result of the lack of history the Brisbane City Council has approved a MASSIVE new Casino/hotel development – what else is there of attraction for a tourist? 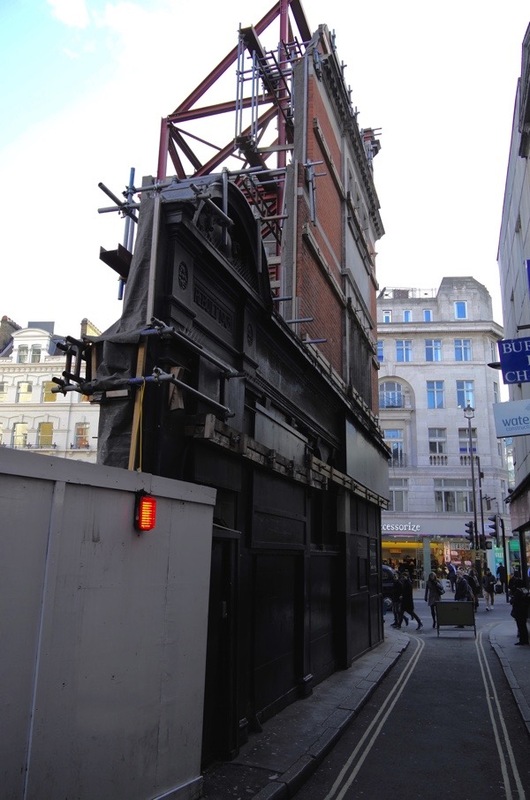 At the rate historical buildings are disappearing in London, perhaps the tourists will stop going there too eventually ….. This also underscores the money involved with film. It’s all eventually throwaway, isn’t it. Disposable. On to the next thing to waste. I couldn’t agree more with the comments above. I have been following some of the ‘redesigning’ of London and have felt devastated by the appalling lack of sympathy demonstrated by developers and architects involved. All in the name of profit. Building for and selling to those who have money but no taste or morals. Sadly it happens across the country with the iconic Cadbury building between Bath and Bristol getting the treatment now. Many similar buildings have been demolished in Bath (one where soldiers met before going to war) to make way for yet more student accommodation. Mostly of designed by those who have no sympathy with the historic city it is. Thank you for highlighting these abominations and just hope there is a way of stopping the rot. Wow, we have ugly buildings combined with lovely old ones where I live in Canada, but I don’t think I’ve ever seen anything as awful as the above here. Ours tend to be ugly but not actually inept, which those are. How appallingly sad and awful. I christen the occupants ” the Laminati” vile and vacuous. material in the national press? You missed the Queen Elizabeth Childrens Hospital in Hackney Rd, and the latest practice of sticking a big photo over the façade while the destruction of the building takes place. This is too sad. Such shams are very unexpected from the English. We have an image of the English culture as being historically correct. I live near Old Tucson movie studios where many cowboy films were made. This view of London just looks like a cowboy-mock-up. Very sad. 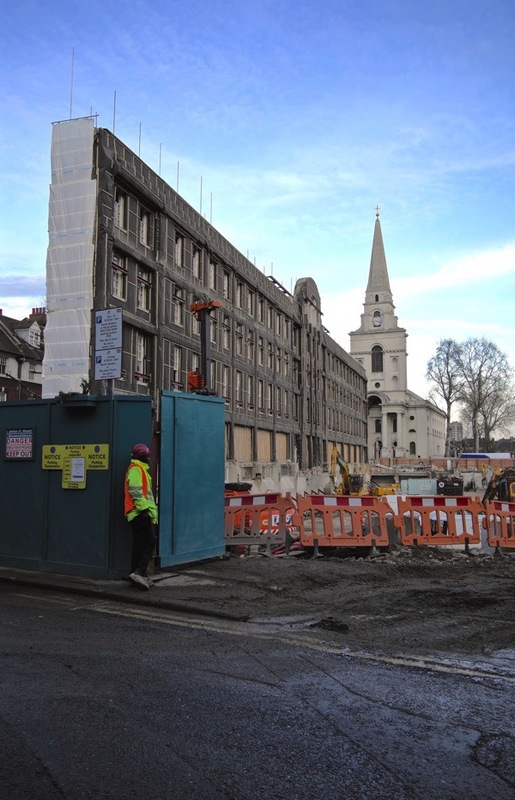 The largest and wealthiest landlord in London is proposing an insensitive redevelopment on the Pimlico Road, London. Of a historic timber yard and six Victorian galleries with an element of façadism. Here is an opportunity to fight these greedy landlord developers. Please spread the word. British (and probably all) modern Architecture is one of the worst tragedies to befall the UK (and probably the world). Somehow, unlike any artform, a fascist uniformity was established in the field of architecture so that, any variety of opinion was stamped out circa 1945 and, instead, replaced with a unified respect/worship of the concrete, and the vast, and the unornamented, and the plain, and the inhuman, and the cold; whilst simultaneously sneering at the small, and the ornate, and the decorated, and the pretty, and the snug, and the human. It’s still the case – more post-corbusian monstrosities are still being put up daily and, with every one, the world becomes a little bit worse. The only straw for an optimisist to grasp at is the hope that in a hundred years or so, the existing fascism of thought will finally have been usurped and the 1% of morons who design buildings will have been replaced by people who reflect the wishes and needs of the 99% of citizens who, without exception, despise the current ugliness designed and built for their benefit! My God, these are vile! I remember Artillery Lane and Gun Street so well. Atmospheric . . .then. Valentine Place, London SE1, site of the former Maltina Bakery. Built in 1910 in a beautiful neo-classical style, the building survived in its entirety for 100 years (including a night of bombing during the WWII Blitz). That is, until the developers decided they wanted to demolish it. A local campaign led to the creation of the Valentine Place Conservation Area and effectively helped save the facade. Unfortunately, Southwark Council subsequently approved an application from the developers to demolish over 50 per cent of the conservation area, including all but the facade of the bakery. 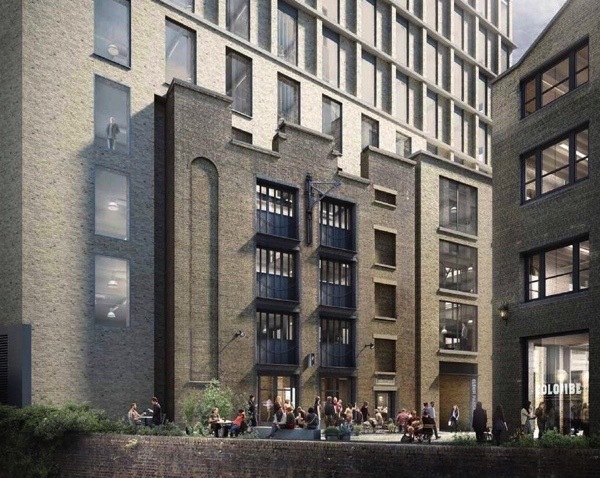 The building is now being marketed at prices starting at £735,000 for a one bed flat and the bakery’s history (oh the irony) forms part of the pitch: “The Architecture is a mixture of new build warehouse style, reflecting its neighbouring buildings and a unique retained façade of the former Maltina bakery.” (https://www.crestnicholson.com/valentineplace/?gclid=Cj0KEQiA89u1BRDz8enExq7rvN0BEiQAaFCHm47zbD9q7kap2VA8JjjNKtSn58P7M2JLH3ysMEuXedUaAt5H8P8HAQ). In 2013 I spent many months researching the bakery’s architecture and history: original internal features included a magnificent vaulted wooden roof, parquet flooring and a unique tiled inner courtyard with skylight access to roof level. 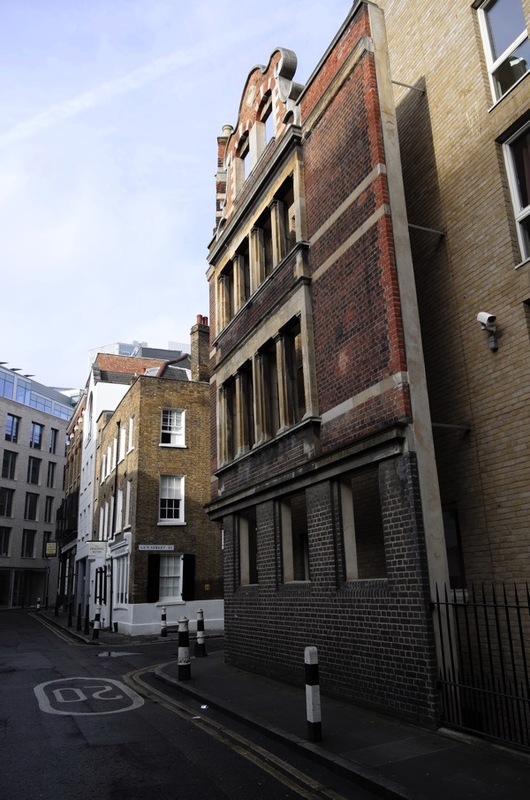 The building could have been retained and re-used but the demolition was approved by the Council and all of these features were destroyed in a perfect example of ‘facadism’. So sad. p.s. 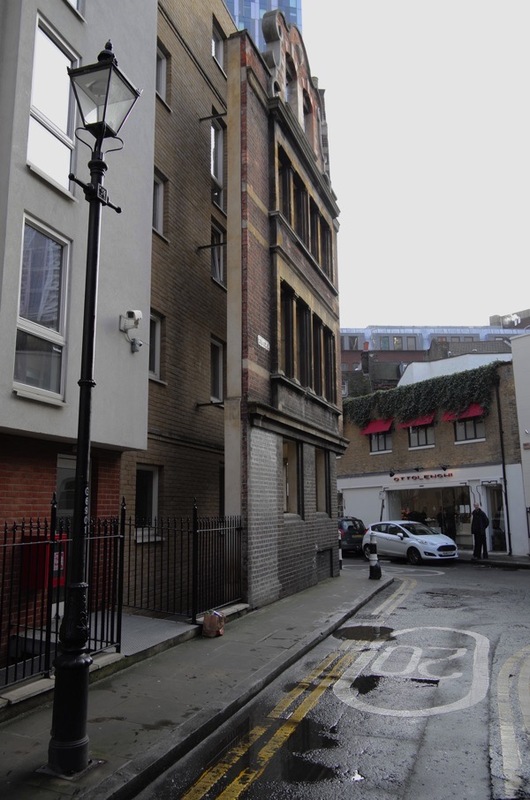 If anyone would like a copy of my research, ‘Saving a Southwark Bakery: The Story of 21 Webber Street and The Valentine Place Townscape’, I’d be happy to provide a link to the PDF. Certainly makes me want to weep. This kind of practice needs to made illegal. 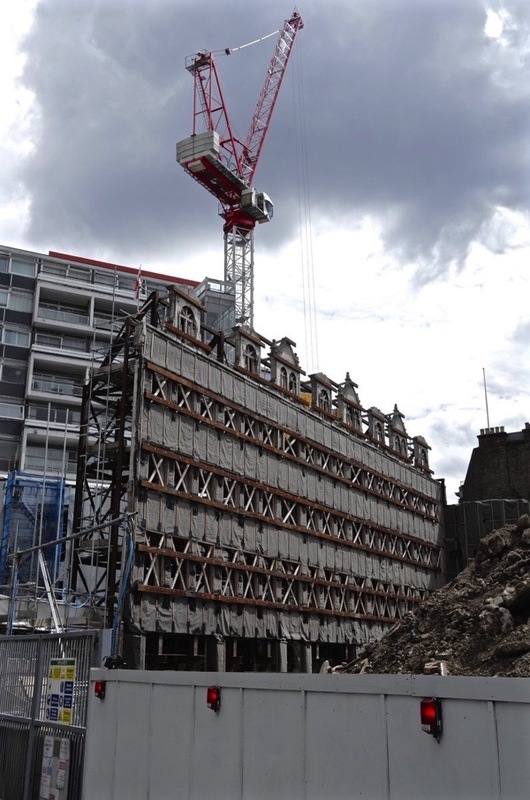 I am currently in the process of writing my MSc thesis on whether facadism has a negative or positive effect on the built environment and would appreciate users thoughts on this subject area. I’m also currently carrying out research for my final year dissertation. 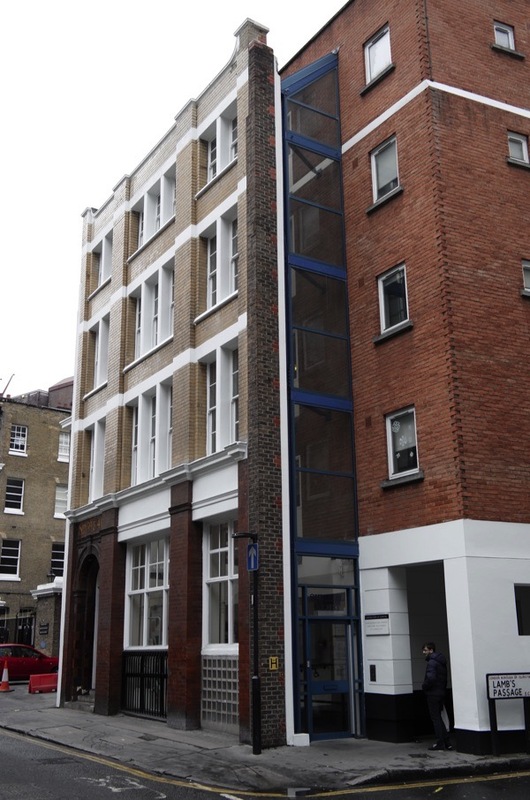 Do you think its ever justified to use façade retention? If the building is derelict and the use of façade retention can inject life into it and preserve the streetscape and urban heritage is that not a positive attribute? I fear it is too late. The horse has bolted having been spurned on by our former mayor of London. So called ‘redevelopment’ is reducing our historic and culturally rich heritage to a sham, Disneylike, ersatz playground for the super rich. An environment stripped of every last ounce of beauty, history, social connection. It is not just money that drives the development ever onwards but a total lack of awareness, care, sympathy, recognition. It is an ignorant machine out of control and there is no one at the reins to apply the break of common sense, decency and rationality. Shame on all those charities that like to applaud themselves for protecting our heritage and the town planners who, like them, meekly acquiesce with these shocking and irreversible decisions. Let’s hope Sadiq Khan has the desire and muscle to put an end to this deeply damaging assault on London and its past. It reminds my of a conversation I had many years ago with a very senior Planner in London.I asked him what was a typical background for one of his Planners.He replied with a chuckle.”Dont tell anyone I said so but they are mostly failed architects ,people who would simply never have made it in your profession.” It seems that the two ‘professions’ have now come together in a cosy relationship.Not quite the oldest profession but with similarities. We are facing the same problem here in Calcutta (Kolkata). “Guardians” of heritage are advocating this approach to allow “development and progress” in the city. I would rather they pull down the entire building and construct something new. Heritage is not about the facade, and good quality new buildings is not about glass facades, especially in tropical climates. Leaving the old facade and constructing something in glass behind that is neither here nor there.